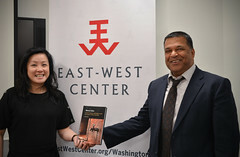 I think I speak for all of us when I say that the East-West Center is in good hands. I was tremendously impressed with Richard’s energy and enthusiasm for embracing the challenges facing the Center over the coming years and the fresh approach he is taking, especially with expansion of the student programs. I’m sure we all look forward to future, and more frequent, visits with Richard. 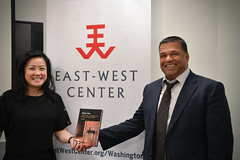 The biggest challenge is ensuring that the East-West Center has the financial resources to continue fulfilling the mission denoted by its official name – Center for Cultural and Technical Interchange Between East and West. But Richard can’t do it all on his own. It’s up to all of us to help support the Center. You can make an online donation by visiting the Center’s website — and clicking the “Support EWC” link. In particular, you might want to contribute to the Wall of Honor, as Gary Yoshida suggested. You can make a donation in honor of someone who’s already named or somebody else, including yourself. As I mentioned, I’ll be attending the Alumni Conference in Seoul in August. I hope that some of you may be able to join me. In addition, Ramy will be attending the EWC International Media Conference in June. Perhaps some of the journalists might wish to join him…. 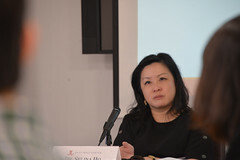 This entry was posted in Alumni, EWCA Chapters, Uncategorized and tagged EWCA New York Chapter. Bookmark the permalink.